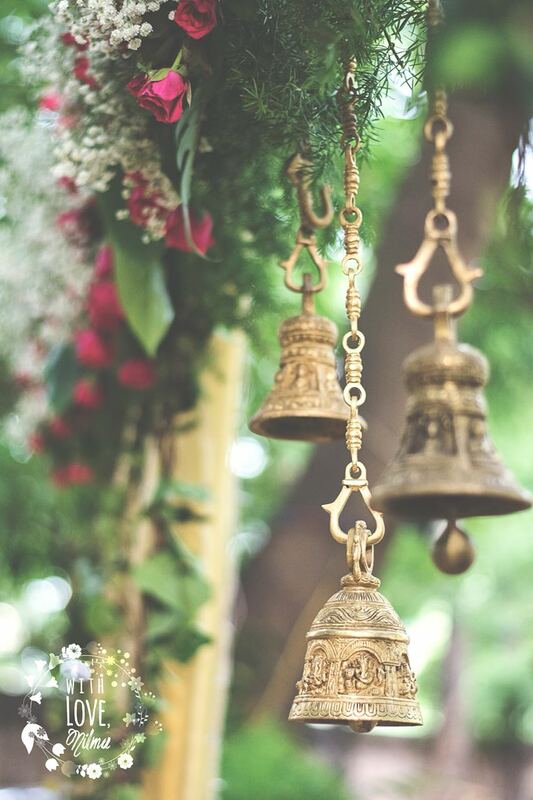 While there are many ways to have an eco-friendly wedding, there are some easy ways to reduce waste and avoid plastic at Indian shaadis. 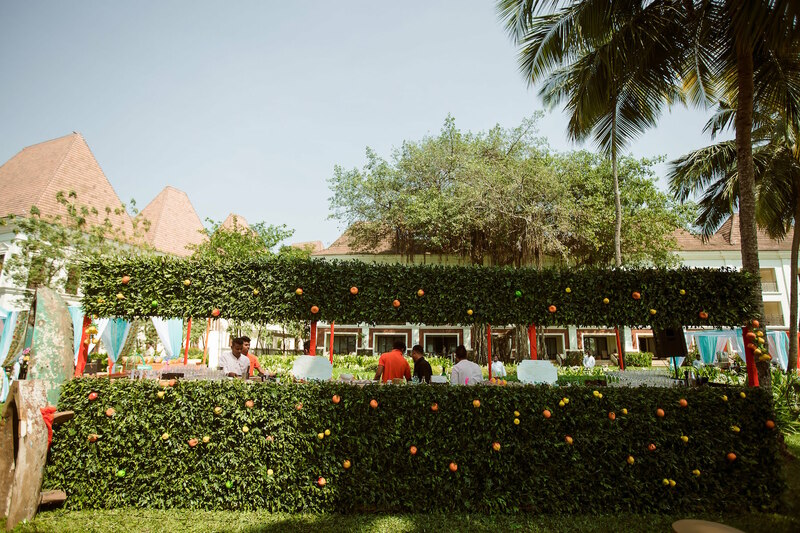 If you think it will mean your wedding looks drab, you definitely need to see what decorator Nilma has done at real events! 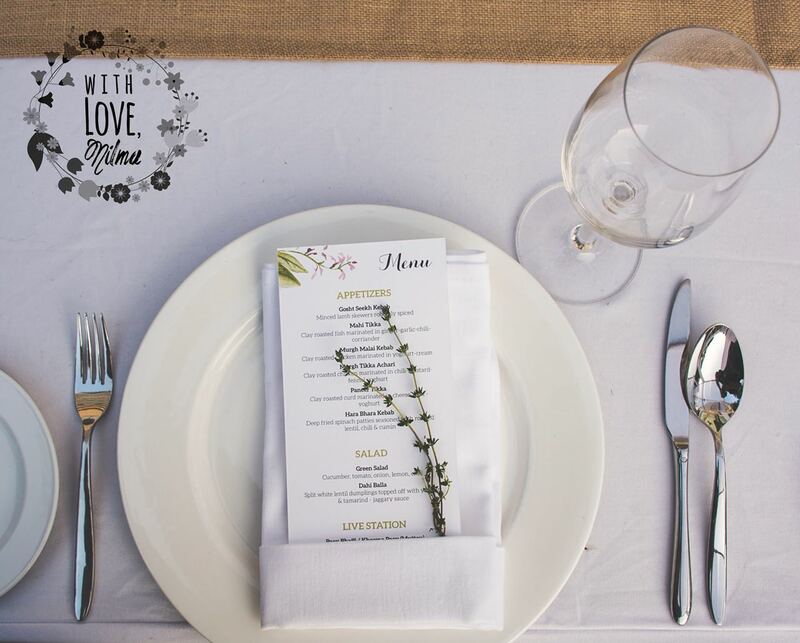 Nilma is an eco-conscious wedding & event designer who runs a decor company named “With Love, Nilma” and she recently revealed the easiest ways Indians can host an eco-friendly wedding, without compromising on the look of the decor or the experience for your guests in any way. 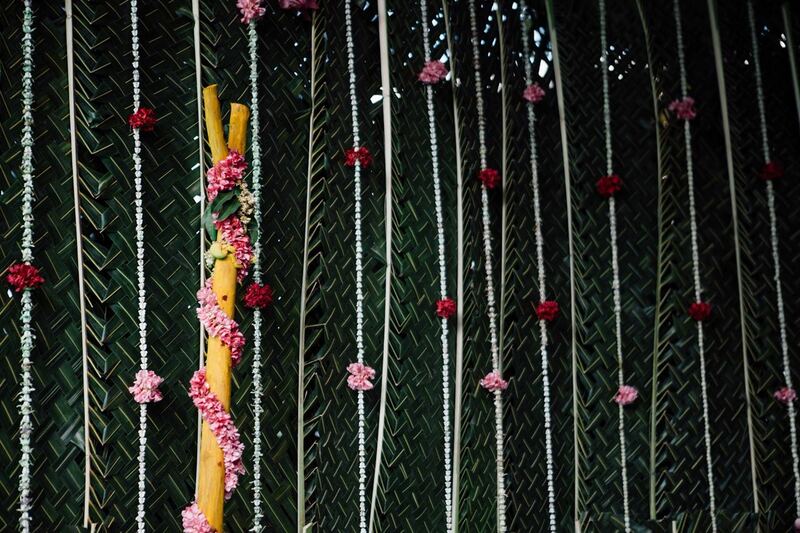 So whether you’re someone who consciously tries to reduce their carbon footprint or you’re the person who just said “carbon what?” – these are some simple tips for keeping any big fat Indian wedding minimally wasteful. 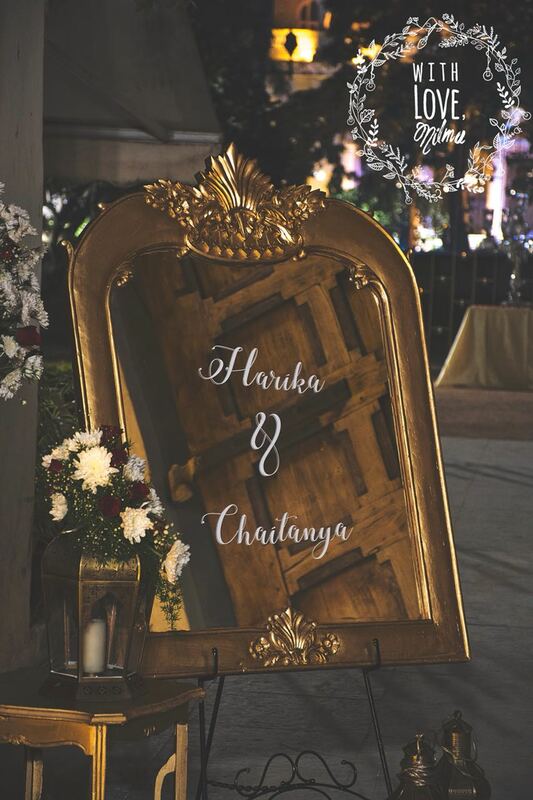 Display signs at the wedding have moved on from the basic “Welcome to Karan & Ashima’s Wedding” to now displaying the couples’ favourite love quotes or even the wedding hashtag at the venue! You can choose to use material that can get re-used later. How? 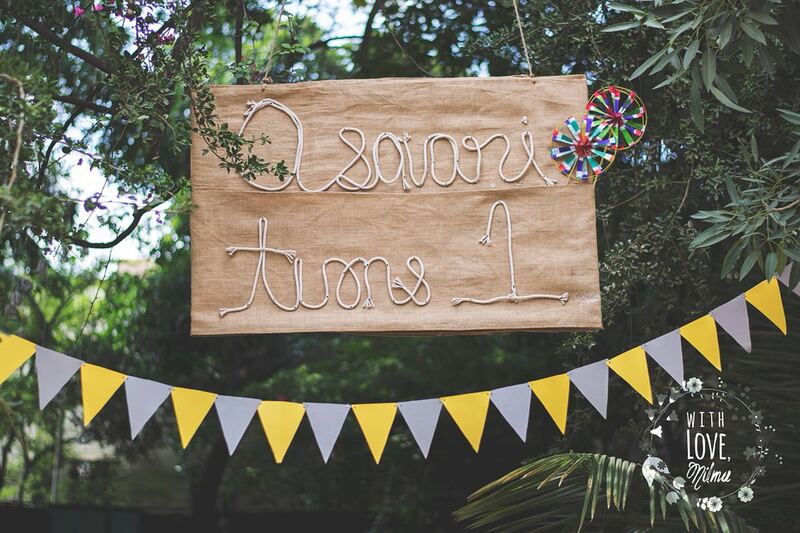 Or you can add a rustic touch by using a jute fabric sign with words made out of rope! This sign = zero waste as both materials can be re-used by the decorator! 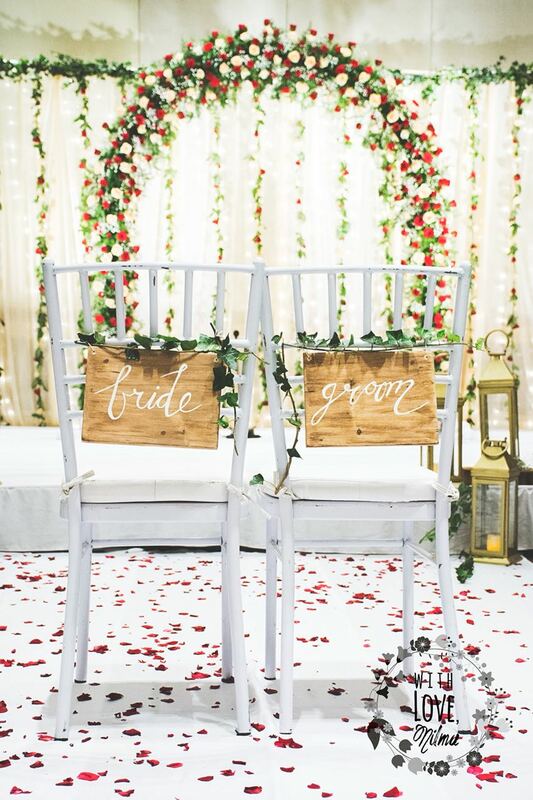 A lot of couples are choosing to create personalised, beautiful bride & groom chairs for them to sit on – either during the Sangeet dance performances or at the end-of-the-evening family dinner table. You can go eco-friendly by using the quintessentially classic wooden signboard for Mr & Mrs Chairs! As awesome as it is to have hundreds of kilos of a certain flower flown down from another city (or country!) it’s not an Earth-friendly decision. Using local and in-season flowers is totally doable – just ensure you request your decorator for the same. 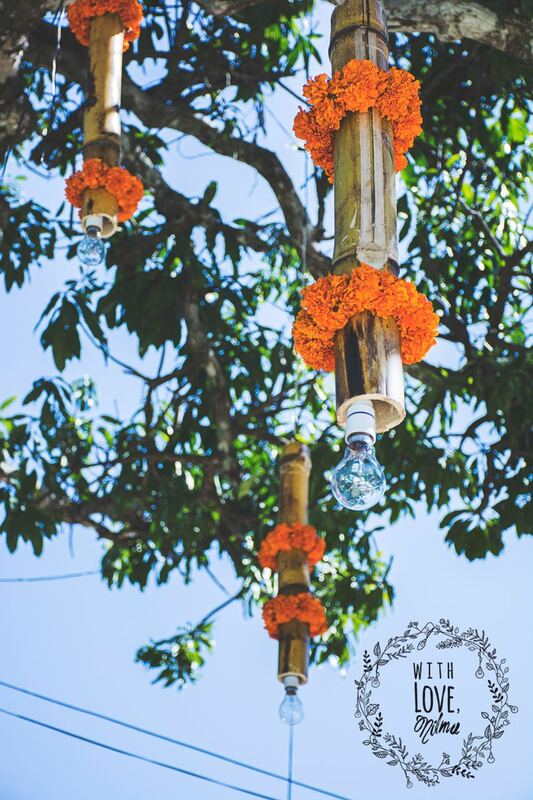 You can also use locally sourced materials, like Nilma did with this bamboo lighting fixture that was created for a Coorg wedding. 4. 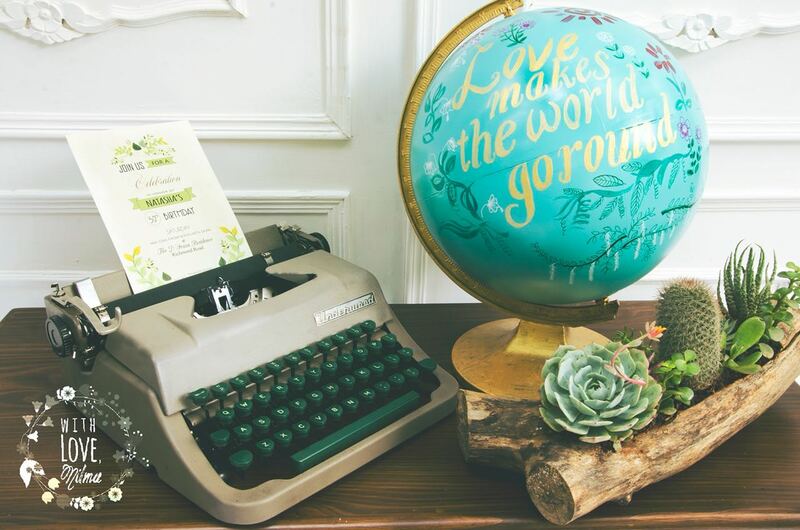 Decor: Repurpose, Repurpose, Repurpose! 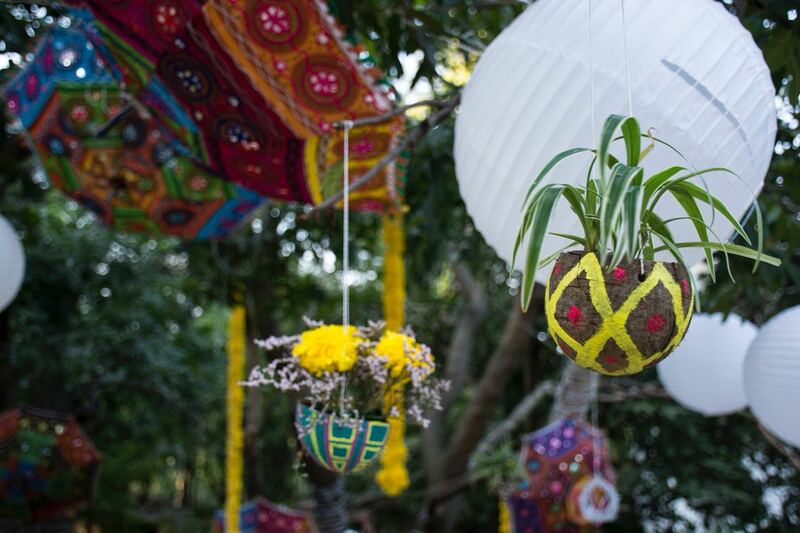 Repurpose used coconut shells as planters or adorn them with flowers. Nilma’s team found a 20 year old(!) 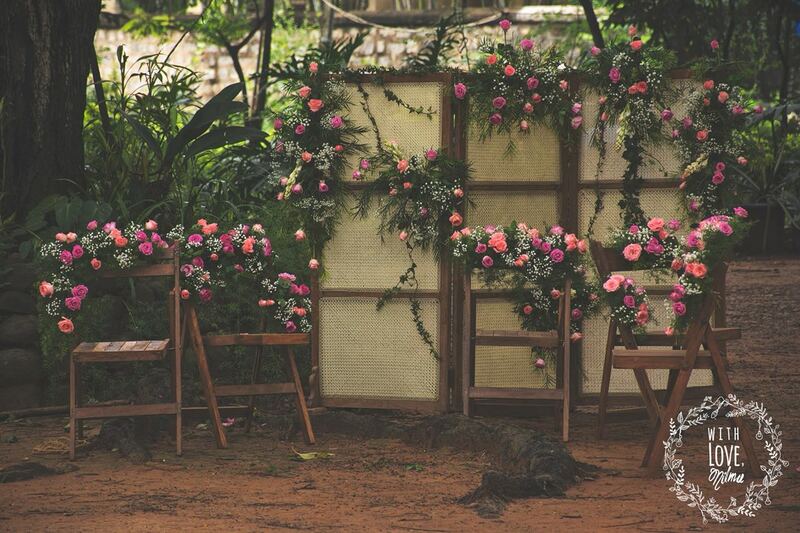 screen divider and wooden chairs lying in a scrapyard in Pondicherry and brought them to life in Bangalore – these have been travelling with them to various venues across India since then! The bar & food areas have become a central decor piece over the last few years, with couples coming up with really creative ideas on how to decorate them! 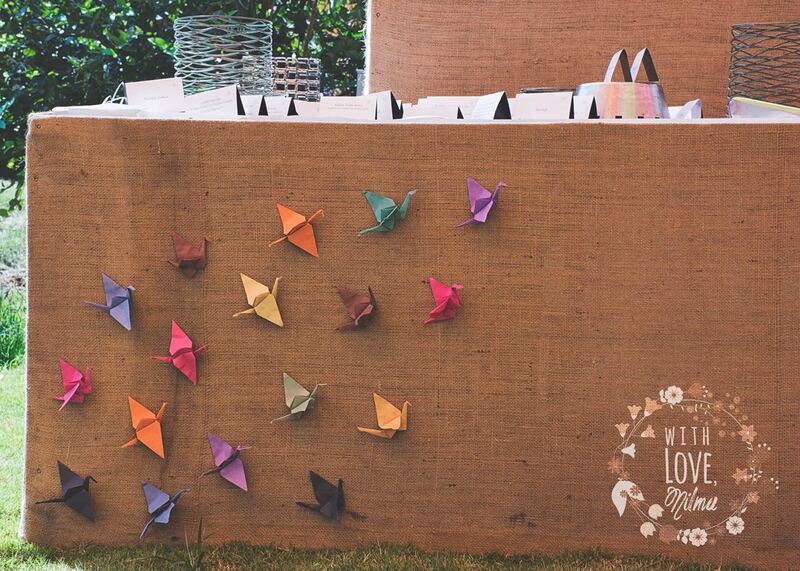 An eco-friendly option is to mask your bar or food counters with jute fabric rather than flex/plastic materials, and adorn them with pretty origami paper cranes. 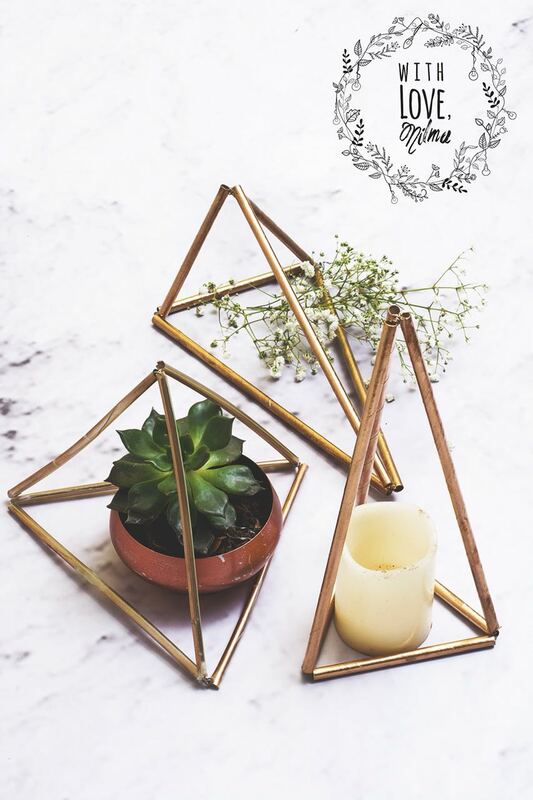 Who knew going eco-friendly could give you such a pretty AND unique bar decor? 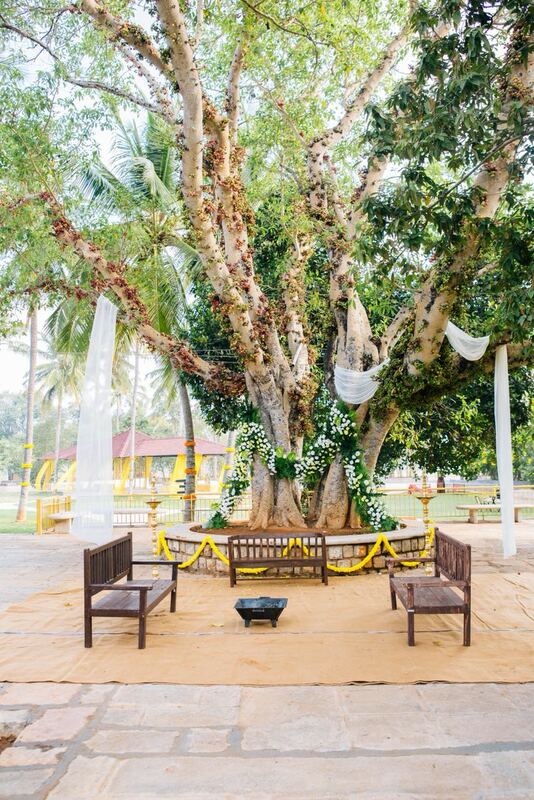 Consider using the naturally available structures at the venue, and incorporating them into the decor. This helps with keeping additional decor material to a minimum. How? You can even ask the guests to take the fruits home at the end of the function. Use a chalkboard sign to inform them! 7. 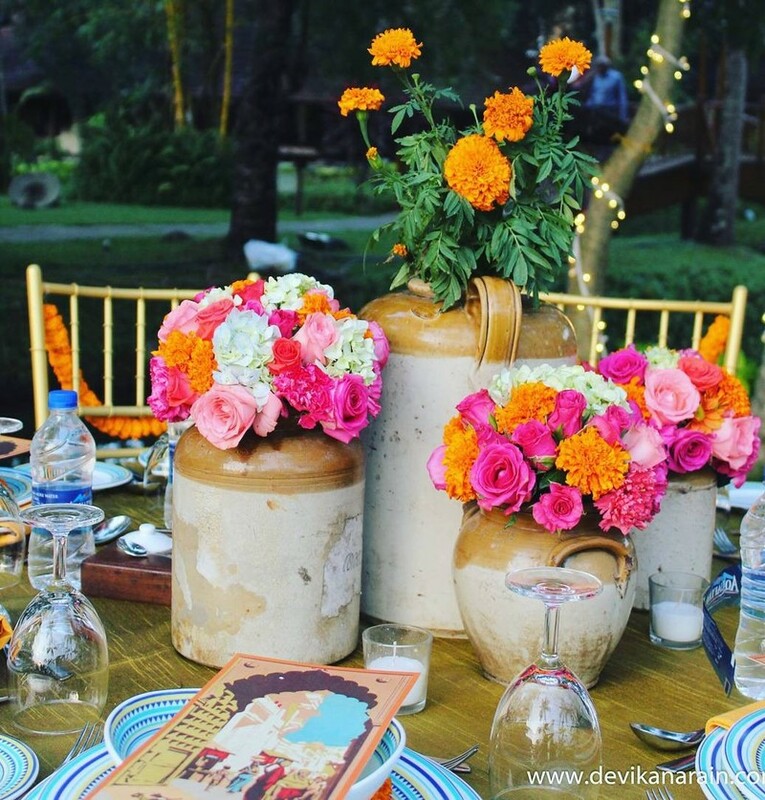 Decor: Table Centrepieces That Are Repurposed or Can Be Used by Guests Later! 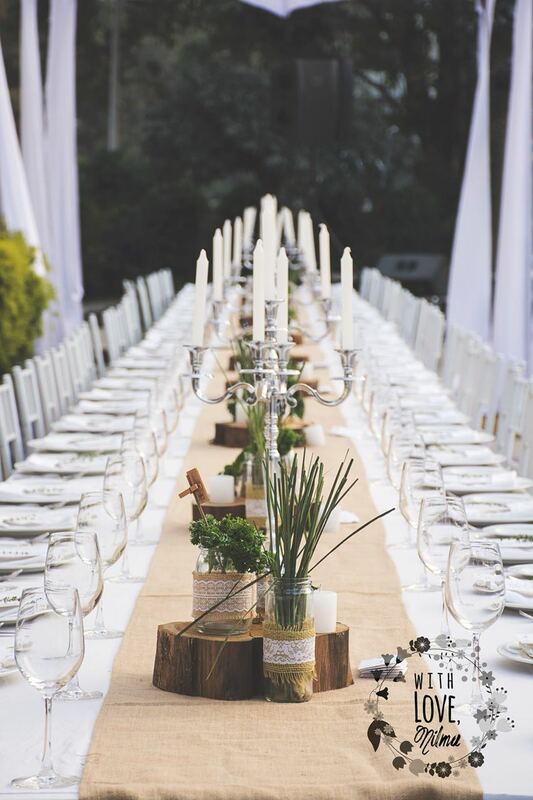 Herbs were set up as centrepieces as this no-flower wedding back in 2016 – how gorgeous and unique do these look! 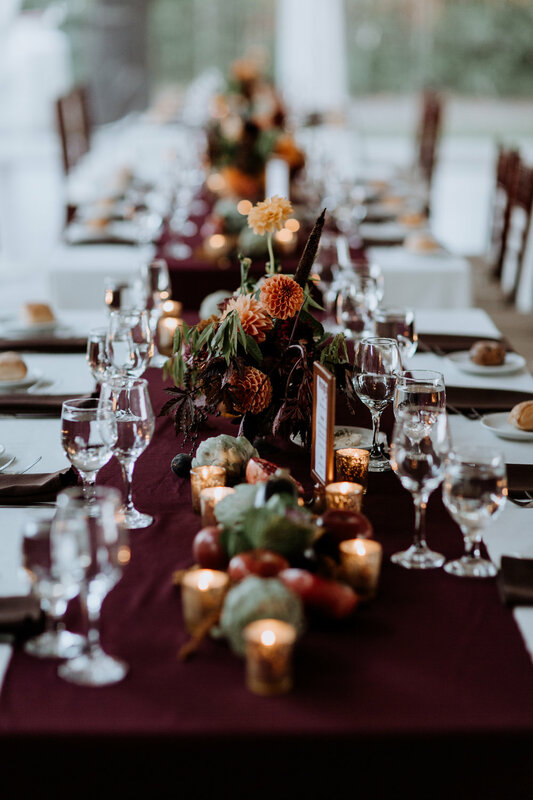 You could also use fruits and vegetables as part of your table decor, that guests can take home afterwards – like they did at this wedding! 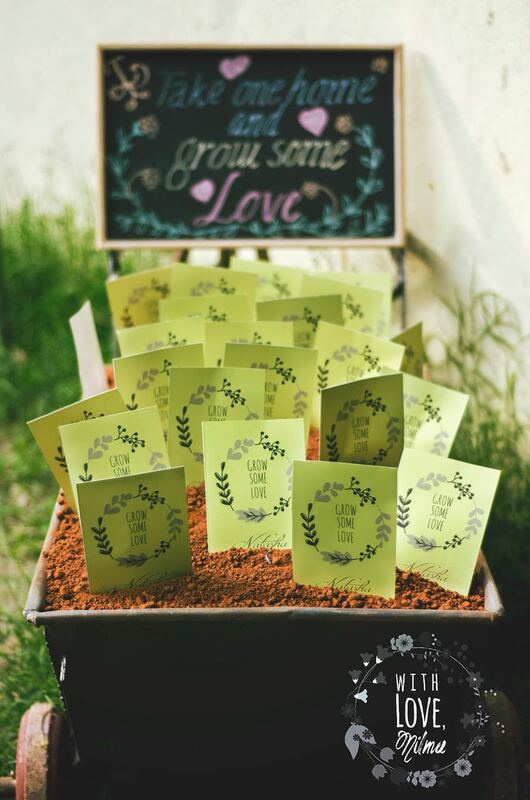 Nilma gave these to guests at her own wedding. 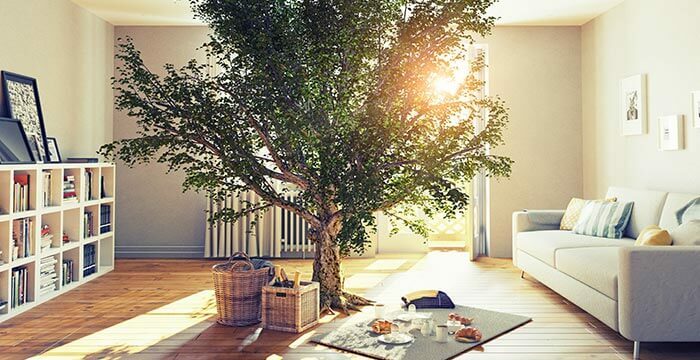 You basically had to go home and plant the seeds and watch the plan grow! 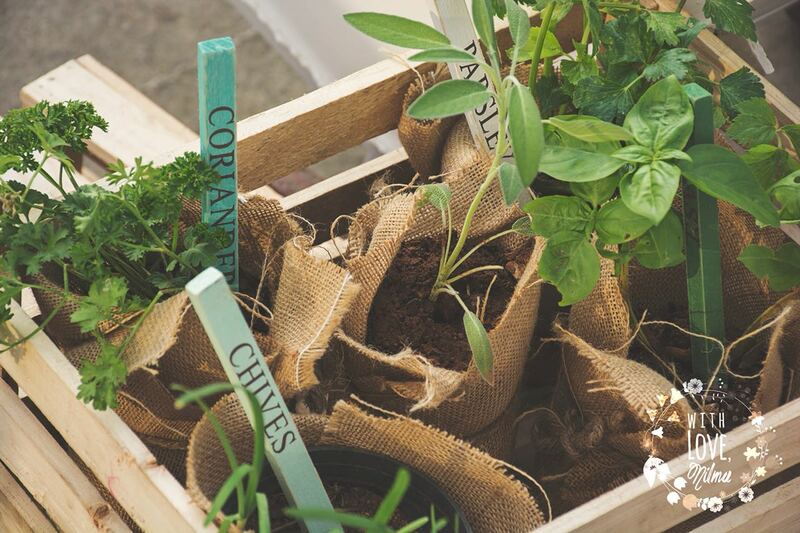 Or potted plants/herbs as giveaways are a great option! Guests can choose which one they want to take home! Just leave them a chalkboard sign on the favours table! 9. 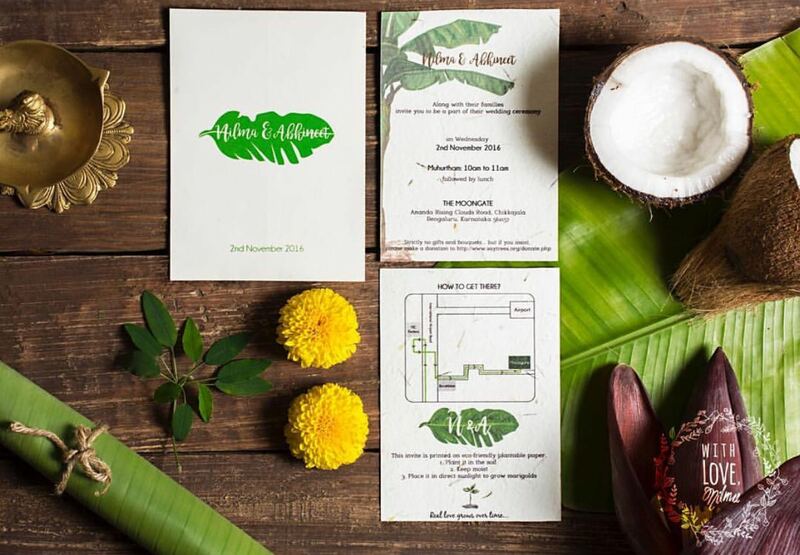 Invites: E-Vites, Seed Paper or Recycled Paper – Take Your Pick! We’re all getting used to receiving wedding invitations via Whatsapp and email. 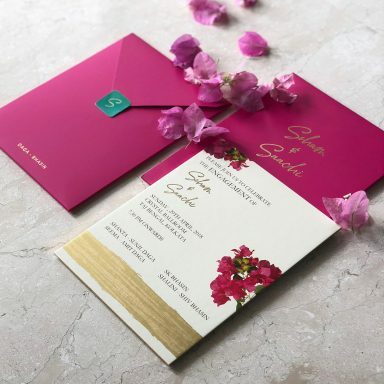 But there’s still a whole generation that needs the physical printed card – in some cases, tradition calls for it and in others, some guests don’t even have email addresses or Whatsapp on their phones! If you’re ok not printing – Send e-vites to most people, especially to all your friends! 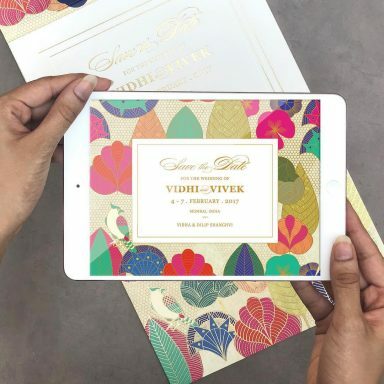 You can either use a service such as Paperless Post (they have an Indian wedding invites section), or DIY by creating a JPEG or GIF invite to send to everyone via email. 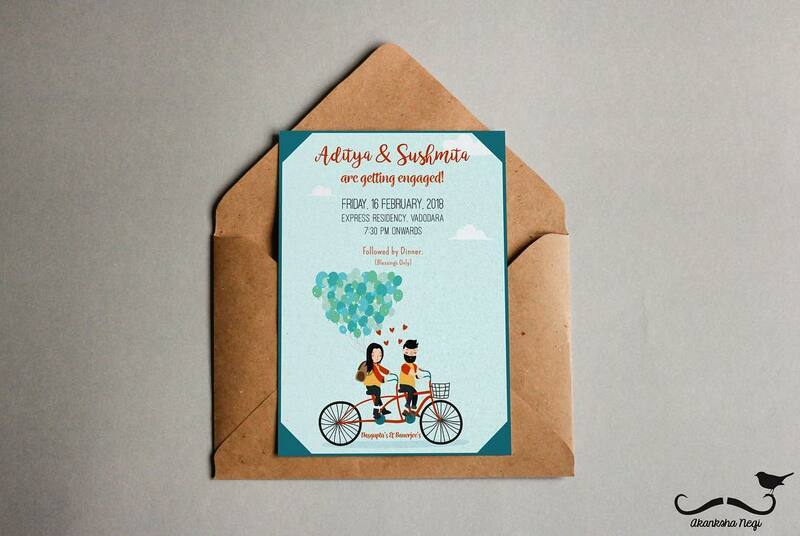 These days, people are directly sending Whatsapp wedding invitations as well. Yes, it is totally acceptable. But do try and type out a quick personalised message along with the Whatsapp invite, so that the friend/relative feels like you do want them there on your big day. 10. Cutlery: Edible & Eco-Friendly Cutlery is a Very Real Option in India! Ditch plastic cutlery and straws and choose crockery that doesn’t go into a landfill. For example, you can choose steel straws instead of plastic ones, and use edible cutlery by India-based company Bakeys! 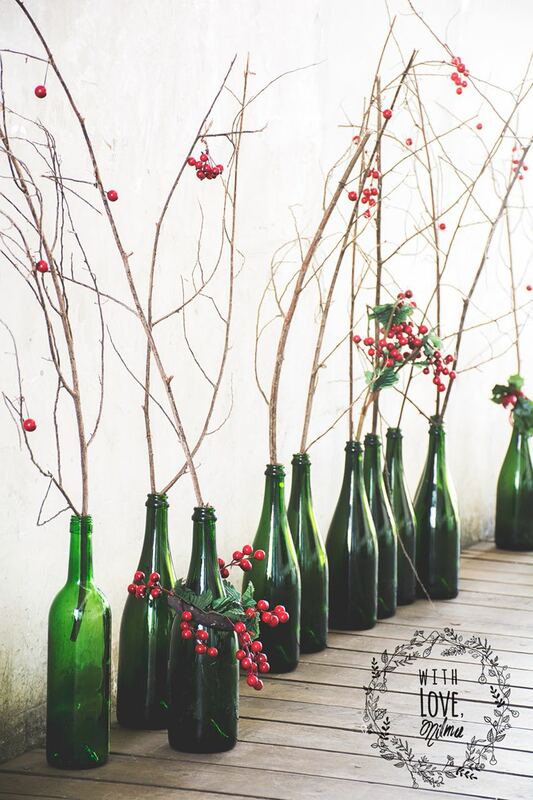 Nilma strongly suggests ditching those horrendous plastic bottles you see piled on every table at weddings! Work out zero waste options with your caterer/hotel. It may seem like an additional task amidst all the planning you have for your big day, but it’s decisions like these that will help us live a life devoid of waste and plastic! So, what does one do about it? The food can be packed & donated to an orphange or similar organization (in Bangalore, Hasiru Dala helps with effective solutions for keeping waste minimal at weddings). 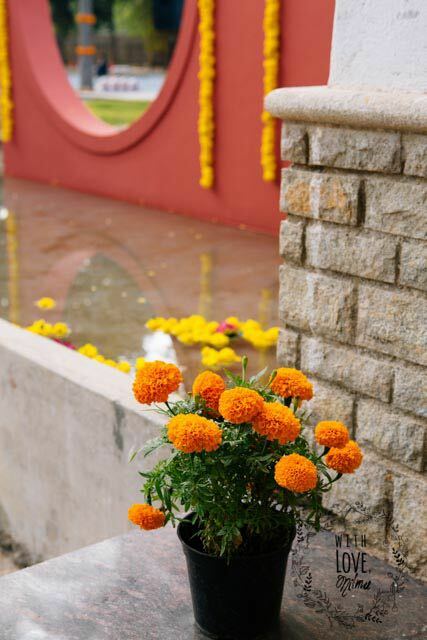 The flowers can be converted into natural holi colours (Delhi’s AVACYAM run by Society for Child Development does this) or converted into agarbattis / incense sticks (check out Mumbai-based Green Wave). For India, that means NOT in the summer! 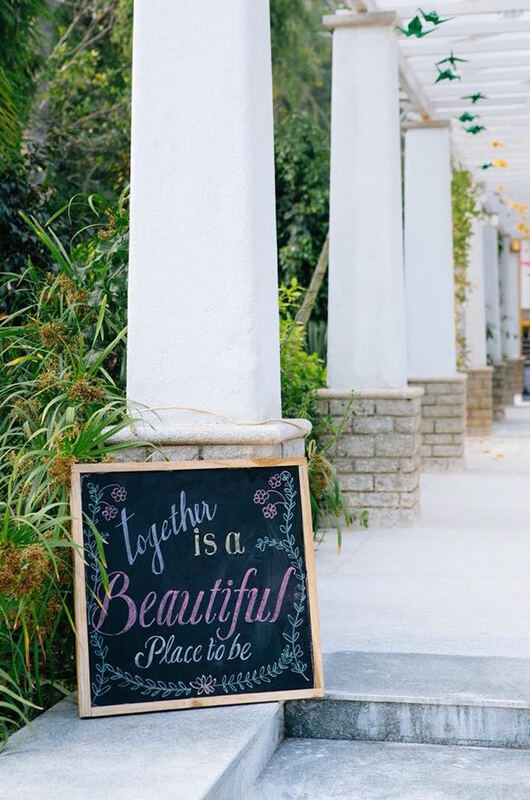 If ALL THESE ways seem like a lot for you, have you ever considered that your whole entire wedding doesn’t have to be eco-friendly? Maybe you pick and choose what is doable, what you like from this list of options? Trust us, even if you use a couple of these tricks, you would’ve saved a TON of waste from getting created on planet Earth. Happy planning! 2 The 6 Month Honeymoon: This Couple Went Around the World in (1)80 Days! 4 The MOST Gorgeous Rani Haar Necklaces We’ve Spotted On Real Brides!